There is no doubt that among Anglican Bishops, David Sheppard's particular blend of interests ensures that his reputation as a leading Bishop will be a lasting one. Many will remember him first and foremost as a former English cricket captain, peculiar in his combination of dedicated cleric and outstanding sportsman. Others will recall his ecumenical strengths and his partnership with the Roman Catholic Archbishop, Derek Worlock, when they were both incumbents in Liverpool. But perhaps his most unique quality, which has made him such a strong personality in the Church, is his concern for the poor and disadvantaged and his refusal to collude with Westminster politics. From early days at the Mayflower in Canning Town, London, to Woolwich and later to Liverpool this is the story of a man struggling creatively with his world and his God. Uncomfortable with theological stereotypes, uneasy with Westminster's policies, always concerned to cut through 'comfortable Britain', this is a fascinating account and also an invaluable cameo of the Church and politics in the second half of the twentieth century. - Publisher Many will remember David Sheppard first and foremost as a former English cricket captain, peculiar in his combination of dedicated cleric and outstanding sportsman, but his time as Bishop of Liverpool in particular has been eventful and inspiring. - Publisher David Sheppard's particular blend of interests single him out as unique among Anglican bishops. An outstanding sportsman as well as a dedicated cleric, many will remember him first and foremost as an English cricket captain. Others will recall his ecumenical strengths and his partnership with the Roman Catholic Archbishop, Derek Warlock, when they were both incumbents in Liverpool. However, it is his concern for the poor and disadvantaged, and his refusal to collude with Westminister politics, that has made him such a strong personality in the church. This book offers an insight into a man who is uncomfortable with theological stereotypes and is concerned to cut through "comfortable" Britain. 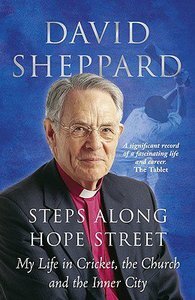 About "Steps Along Hope Street"
Many will remember David Sheppard first and foremost as a former English cricket captain, peculiar in his combination of dedicated cleric and outstanding sportsman, but his time as Bishop of Liverpool in particular has been eventful and inspiring. David Sheppard's particular blend of interests single him out as unique among Anglican bishops. An outstanding sportsman as well as a dedicated cleric, many will remember him first and foremost as an English cricket captain. Others will recall his ecumenical strengths and his partnership with the Roman Catholic Archbishop, Derek Warlock, when they were both incumbents in Liverpool. However, it is his concern for the poor and disadvantaged, and his refusal to collude with Westminister politics, that has made him such a strong personality in the church. This book offers an insight into a man who is uncomfortable with theological stereotypes and is concerned to cut through "comfortable" Britain.